29.3.2014 Madagán Bonbon (Velo) debuted in Savitaipale group show. He placed BM3, got a very nice critic and a rosette as memories of this historical day. Judge was Miss Jette Tschokkinen. Many thanks to Johanna and Leevi for their interest and participation on different kinds of events on last year. 23.1.2014 What a great start for this year! Madagán Alberto (Leevi) participated 19.1.2014 into Obdience Competition in Porvoo and gained his thrid 1. prize in Novice Class with points 174 and title TK1. He is now ready to compete in Open Class. Big congrats to his owners Johanna & Mika, especially to Johanna who trains and competes with Leevi. 5.10.2013 Speciality Show in Hyvinkää. and Pepitahill's Kathleen (Lilly) placed 2nd in Open Class with CQ. 22.9.2013 We held a second Madagán meeting during this year. This time we met in Linlo in Kirkkonummi. It was a nice to see so many of our breedings. 5.9.2013 Our A litter has 3rd birthday today, happy birthday to Ally, Aatu, Saga and Leevi. 22.8. 2013 Happy 1st birthday to our B litter -Terry, Gilda, Tofu, Velo and Kreivi. 10.8.2013 Obedience Competition Hyvinkää, judge Ossi Harjula. 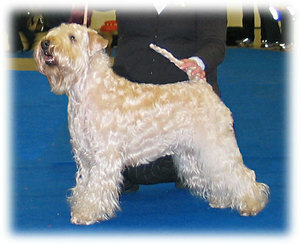 Madagán Alberto (Leevi) participated into Novice Class and gained 1. prize with points 166. 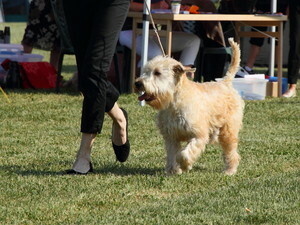 He was handled by his owner Johanna Sulli. Big congratulations! Greetings from over seas. 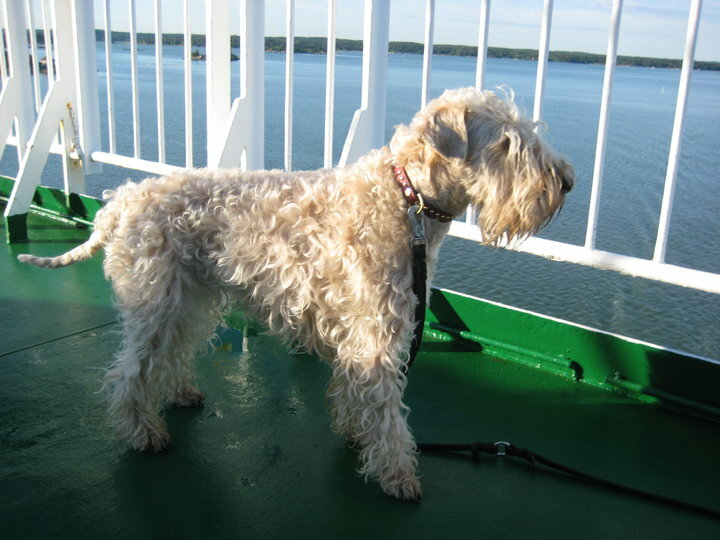 We traveled to Sweden with our three dogs for a holiday and to meet some "relatives" too. Gilda met her sire for the first time and Lilly met her breeder and her old pack. 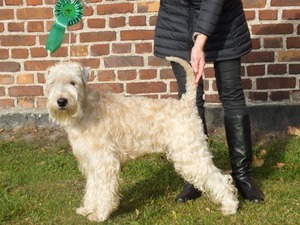 18.7.2013 Irish Breed Festival, Eskilstuna, judge Colm Hastings, IE - Gilda's first official show, she got a great evaluation and placed JUN3. Many thanks to Jörgen who handled our little runaway. 20.7.2013 Köping Int, judge Elisabet Janzon, SE - Elin BOB- C.I.B. * and among the seven best in group final! Very nice journey in all the way. Shared joy is bigger and our good friends team had success during all three days. Many thanks to my dear husband, it was great to have him with us and share all the unforgetable moments and days with him. 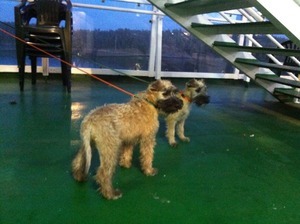 We had two more wheatens when headed back to Finland, new members of our Team Madagán. Team Tuulitukat placed 12./32 in Midi-sized class, time was 16,08. The time is calculated by 2. and 3. fastest time of a team. In this size class there was totally 128 runners. Leevi was fast like a wind got an excellent time and placement! Gilda was slightly over the age of 9 moths which was age limitation for this competioin. We are so proud of our breedings. Even Lilly was entered into this team and was with us trainings she couldn't participate and she was replaced with Enni. Team Tuulitukat from left to right: Elin, Allu, Johanna, Leevi, Marko, Gilda, Hannu, Enni and Ritva. Thank you all. Next year hopefully we'll have a team consisting our own breedings only, let's see. Yesterday we had a Puppy Meeting for our B litter. It was a really nice afternoon and we had so much fun together. A group photo is seeable on the B litter page. We have added some new individual photos too. 4.11.2012 It was a time for a second happy reunion during this week. 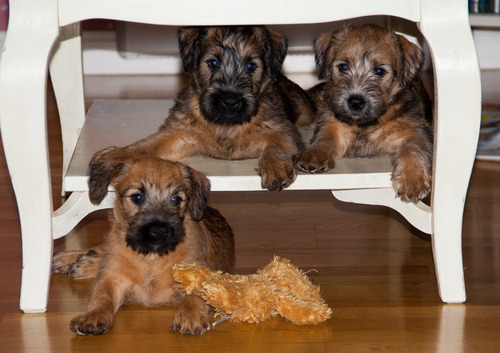 Lilly and her puppies participated into Hannes Lohi's Canine Genetic Studies. Great to have so co-operative people around us. 29.10.2012 Our B litter was officially eye checked- all five have healthy eyes. 16.9.2012 Madagán Alberto (Leevi) passed through MH test in Porvoo. 5.9.2012 Happy 2nd Birthday to our 1st litter. 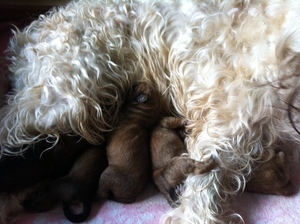 22.8.2012 Lilly had great timing and puppies were born within 71 minutes. She and her treasures are doing fine and we had the most wonderful 20th Wedding Anniversary day by welcoming our new family members. 19.7.2012 Lilly's pregnancy is confirmed by an ultra sound test. She is doing fine. 22.6.2012 Ture (Villa Rosas Uisge Tyrconnel) visited Lilly and experienced The Finnish Midsummer. 11.6.2012 A -litter was health checked in the beginning of this summer. 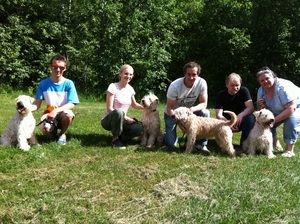 Results are available on their individual pages and naturally also on Finnish Kennel Club's Database. 21.4.2012 Lilly making through MH test in Porvoo. 17.9.2011 DTK Hedensted. Judge Mrs Gertrud Hagström, Sweden. 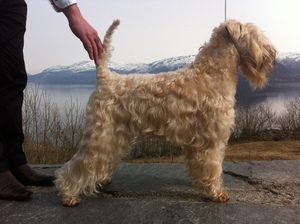 Elin CHAMP - EXC1, BB1 - CAC - BOB -> DK CH & NORD CH. What a day! 5.9.2011 Happy 1st Birthday to our 1st litter. 7.7.2011 Championnat de France. Judge Mrs Gertrud Hagström, Sweden. Elin OPEN - EXC1 - C.A.C.S. It was a nice trip, even very tight with time schedules. We are pleased with our results, time spent together with our friends and of course last but not least that we could refresh our French skills:). 19.6.2011 Kotka Int. Judge Mr Colm Hastings, Ireland. Lilly JUN - EXC4, Elin CHAMP - EXC1, BB2 - CACIB. 11.6.2011 Speciality show, Helsinki. Judge Mr Nicholas White, Ireland. Madagán Alberto and Madagán Aurora took part for the first time in Junior classes. It was the first show ever for Alberto and for his handler/owner. Aurora was showed for the first time by her owner and this was the first show for her too. Both got very good critic. We were very pleased with our Madagáns, thanks to Johanna & Mika, Linda! 5.6.2011 Today we had our first puppymeeting. Pictures can be found later on the A litter's page. Villa Auroras Atilla "Sune". * = to be confirmed by FCI. Congratulations to the sire of our A litter. 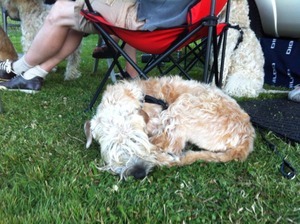 10.5.2011 20 HAPPY years with HAPPY wheatens! 25.2.2011 Our sunshine Lilly has her first birthday today, congratulations! Thank you Carina for this lovely little dog. 19.2.2011 PuppyCup, Lohja. Judge Mrs Hannele Jokisilta. 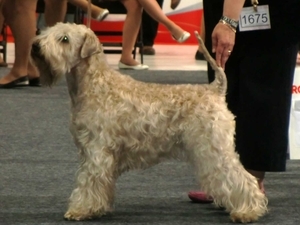 Madagán Aurora "Ally" participated in her first show in Baby class and ended up second. 14.2.2011 We took a short breake from this neverending winter and visited our friends in Germany. Congratulations to our hosts and thank you for your warm hospitality. Happy Valentine! 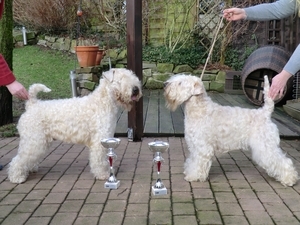 Happy Rheinland Winners 2011 Ted & Elin Photos by Herr C. E.
5.9.2010 Madagán's first litter has arrived. 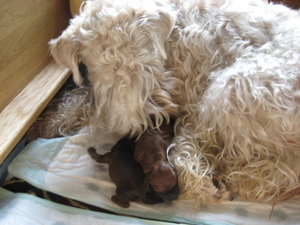 Today, Sunday Elin gave birth to two male and two female puppies. Dam and puppies are doing very well. Lilly debuted show world, got a rosette and placed 4th in Puppy Class 5-7 months. 5.8.2010 Today Elin had an ultrasound test and we saw and heard that her belly is "full of puppies". She is doing very well. 23.7.2010 Elin had her 4th birthday. Congratulations! 22.7.2010 Elin's SE CH was confirmed. My girl:). 7.-8.7.2010 Sune (Villa Auroras Atilla) and his family visited Elin and us and "the romance" which begun in Denmark had it's fulfilment during the warmest and most beautiful days in this summer. Congratulations to winners and thank you all for nice athmosphere during these events. Aptus International Show Helsinki 23.5.2010. Judge: Mrs Renée Sporre-Willes, Sweden. We had a quite nice start for this year, Elin placed BB4. Elin won Show Dog of the Year 2009 competition arranged by Etelärannikon Tassutiimi ry (Ertti). Our team had an excellent show year:). We received some excellent news today. 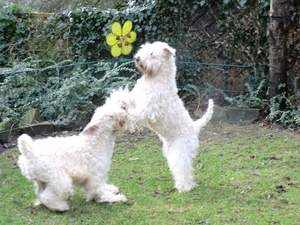 Our Kennel Name Madagán has been approved by FCI on 17.3.2010. 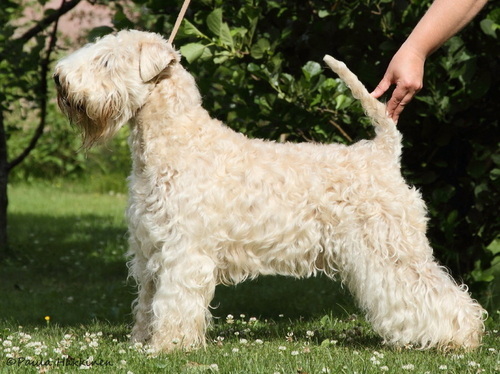 Elin placed 5th in Wheaten of the Year 2009 competition. Congratulations and many thanks for her breeder Tiina Salmivuori. Photo is taken from Turku International 29.11.2009 where she was selected to be BOB for the third time during year 2009. Photo is taken by Katja Päivinen. Welcome to visit our pages!